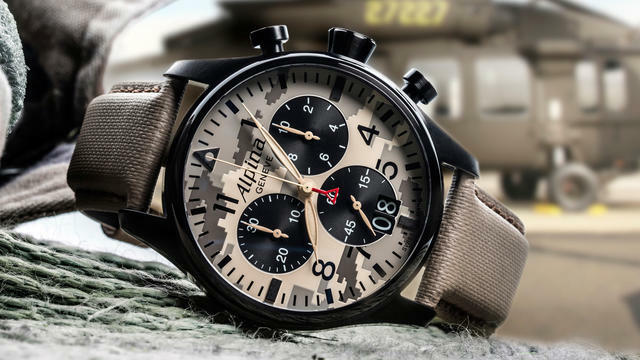 Alpina uses their experience as an official supplier of military and pilot watches to develop a new version of its iconic Startimer Pilot Big Date Chronograph. Early aviation pioneers had strict requirements for their instruments, they need to be precise and provide ultimate shock resistance. 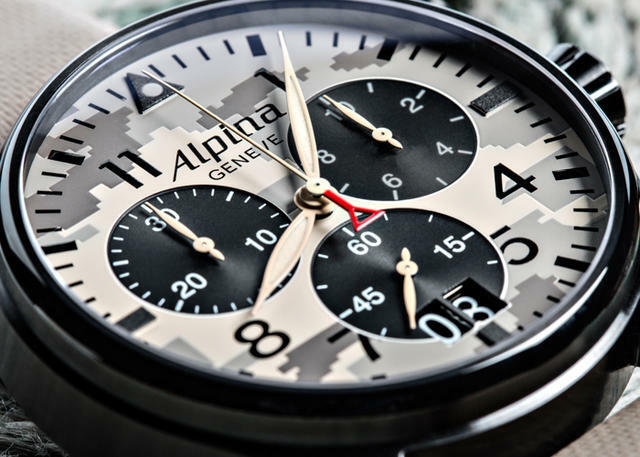 Alpina also provided an anti-magnetic case,a high contrast dial with oversized luminous numerals and hands for instant readability. This new 2016 edition of the Startimer Pilot Big Date Chronograph comes with a new attractive military camouflage design and all the qualities expected in a high-performance Pilot’s watch: precision, functionality and readability. The masculine timepiece is rounded off by a stainless steel case with black PVD coating and a beige genuine leather strap.